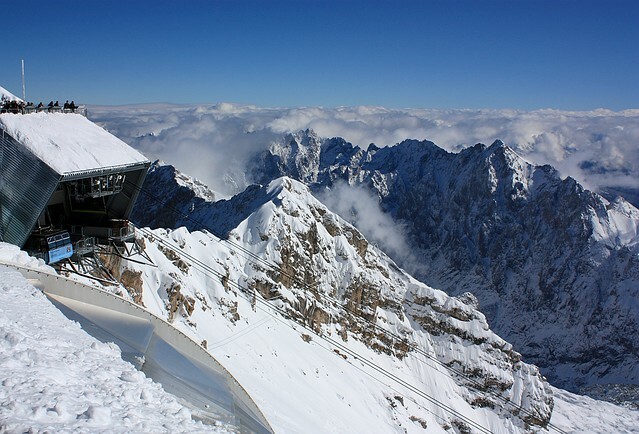 Here you are; you’ve made it all the way up onto Zugspitze, the highest point in Germany. You’ve always appreciated receiving handwritten mail in letters or postcards. As you’re traveling, it’s time you reciprocated by sending cards to family and friends, and you’ve written up a few postcards, ready to send. You’ve come up to the summit and you have the postcards in hand with correct postage already affixed to the postcards. And in passing, you’ve just noticed there’s a mailbox here … at an elevation of over 9700 feet (almost 3000 metres) above sea level. Sitting on Zugspitze’s west peak is the Münchner Haus (Munich House), started in 1897 and maintained since by the Deutscher Alpenverein (German Alpine Club). The building has the mailing address and post-code: “Münchner Haus, 82475, Zugspitze”. The accompanying and familiar yellow Deutsche Post mailbox here on Zugspitze is the highest in the country (obviously), and the box’s contents are emptied at 1030am every morning except Sundays (“Leerungszeiten”). There’s no guarantee your mail will get a “Zugspitze” postal mark before the mail is sent to its destination, but one thing is true: that mailbox has a stunning view of the Alps to call its own. Münchner Haus, Deutscher Alpenverein (2011). Münchner Haus’ east-southeast view, towards Gletscherbahn (glacier cablecar) and Reintal valley (2011). On a repeat visit to Zugspitze in 2017, I discovered the mailbox on the summit was no more. The “highest” mailbox and post office in Germany is located in the warm confines of the Sonn Alpin on the Zugspitzplatt plateau below the summit proper. Deutsche Post office with PLZ (postal code) 82475 at the highest point in Germany. I made the photos above on 9 October 2011 and 25 February 2017. This post appears on Fotoeins Fotopress at fotoeins.com as https://wp.me/p1BIdT-4h2. Hahahaha! “Air mail”: I should’ve thought of that, too! 😉 Thanks, Maria, for reading and for your comment! I like Maria’s “air mail” take on this 🙂 This is also probably one of the best places to mail a postcard. That view is gorgeous! It’s a pretty neat souvenir to receive. Did you mail a postcard to yourself from here? Hi, Mary. On my first visit many years ago, I discovered the mailbox. I bought postcards at one of the shops at the Zugspitze summit, and I figured out the appropriate stamps. It’s possible I bought some stamps beforehand in the valley below; I do like being prepared. I wrote the postcards, stamped them, and put them in the mailbox. Come to think of it, I think I sent postcards to other people around the world, but not to myself, which is what I often forget! On my 2nd visit to Zugspitze, I finally got around to photographing and writing about that wae yellow mailbox. 🙂 Thanks for reading and for your kind comments! I love sending and receiving postcards, and think this would certainly be the most memorable! Hi, Heather; I apologize for my late reply. It’s fun to discover there’s a mailbox here on the top of Germany’s highest mountain, and it’s also fun to think about what journey your mail or postcards will take on the way to their final destination. Thanks for reading and for your comment!